Cutaway of the Skylab space station. After the completion of Apollo, Skylab, and ASTP programs there was still significant Apollo surplus hardware. Plans to use it were cancelled; an opportunity to launch an International Space Station, at a tenth the cost and twenty years earlier, was lost. Launched: 1975. Number crew: 3 . NASA realized that after the completion of the Apollo, Skylab, and ASTP programs there would still be significant Apollo surplus hardware. This amounted to two Saturn V and three Saturn IB boosters; one Skylab space station, three Apollo CSM's and two Lunar Modules. After many iterations NASA considered use of these assets for a second Skylab station in May 1973. A range of options were considered. Saturn V SA-515 would boost the backup Skylab station into orbit somewhere between January 1975 and April 1976. It would serve as a space station for Apollo and Soyuz spacecraft in the context of the Apollo ASTP mission. The Advanced or International Skylab variants proposed use of Saturn V SA-514 to launch a second workshop module and international payloads. This station would be serviced first by Apollo and Soyuz, then by the space shuttle. Using the existing hardware, these options would cost anywhere from $ 220 to $ 650 million. But funds were not forthcoming. The decision was taken to mothball surplus hardware in August 1973. In December 1976, the boosters and spacecraft were handed over to museums. The opportunity to launch an International Space Station, at a tenth of the cost and twenty years earlier, was lost. A study was conducted to determine the feasibility of providing an artificial gravity operating mode for a second OWS. - . Nation: USA. Program: Skylab. Flight: Skylab B. Spacecraft Bus: Skylab. Spacecraft: Apollo ATM, Skylab. A study was conducted to determine the feasibility of providing an artificial gravity operating mode for a second OWS. Study results indicated there were several areas of the OWS that would require unique configuration characteristics. Among the areas of concern were antenna location and coverage; CSM/MDA docking interface strength; reaction control system characteristics, propellant consumption, and attitude control logic to maintain solar orientation in the face of gravity gradient torques; ATM mounting and deployment provisions; and the ATM solar array structure. 1969 August 8 - . Two Orbital Workshops for the Apollo Applications Program. - . Nation: USA. Program: Skylab. Flight: Skylab B. Spacecraft: Skylab. Definitized contract with McDonnell Douglas for two Orbital Workshops for the Apollo Applications Program. MSFC definitized the existing contract with McDonnell Douglas for two Orbital Workshops for the Apollo Applications Program, converted S IVB stages to be launched by Saturn V boosters. The contract was slated to run through July 1972, with most of the work to be performed at the company's plant at Huntington Beach, California. The first Workshop was tentatively scheduled for flight in mid-1972, with the second article initially serving as a backup vehicle if needed. 1969 September 5 - . Guidelines for a second Skylab OWS. - . Nation: USA. Program: Skylab. Flight: Skylab B. Spacecraft: Skylab. 1969 September 11 - . LV Family: Shuttle. Launch Vehicle: Space Shuttle. Two major directions were identified for NASA manned space flight in the next decade. - . Nation: USA. Program: Skylab. Flight: Skylab B. Spacecraft: Columbia, Skylab. 1970 April 7 - . A Manned Space Flight Management Council meeting at KSC focused on a second Skylab Program. - . Nation: USA. Program: Skylab. Flight: Skylab B. Issues discussed were whether there should be a Skylab II, and, if so, what its fundamental mission and configuration should be, how long it should stay in orbit, what its experiment payload should be, and how many manned launches should be planned for it. MSC recommended that artificial gravity and expanded Earth-survey experiments be included as major objectives of a second Skylab Program. 1970 May 14 - . Docking a second Orbital Workshop to Skylab 1 seen to be difficult. - . Nation: USA. Program: Skylab. Flight: Skylab B. Spacecraft: Skylab. The feasibility of docking a second Orbital Workshop to Skylab 1 had been under consideration. However, the practical problems that would be engendered by such an operation were formidable. They included such items as docking loads, docking control, flight attitude of tandem Skylabs, consumables, and in-orbit storage of Skylab 1. A study, which was initiated in April concerning a second Skylab Program, had generated sufficient data for planning purposes. - . Nation: USA. Program: Skylab. Flight: Skylab B. A study, which was initiated in April concerning a second Skylab Program, had generated sufficient data for planning purposes. The study indicated that a second set of Skylab missions would provide a useful and worthwhile continuation of manned space flight in the mid 1970s, even if the hardware were unchanged. It would also offer an economically feasible program option if future funding for the Space Shuttle Program fell behind the anticipated growth rate. 1972 December 7 - . Objection voiced to Saturn V termination immediately following the first manned mission of Skylab. - . Nation: USA. Program: Skylab. Flight: Skylab B. 1973 March 19 - . 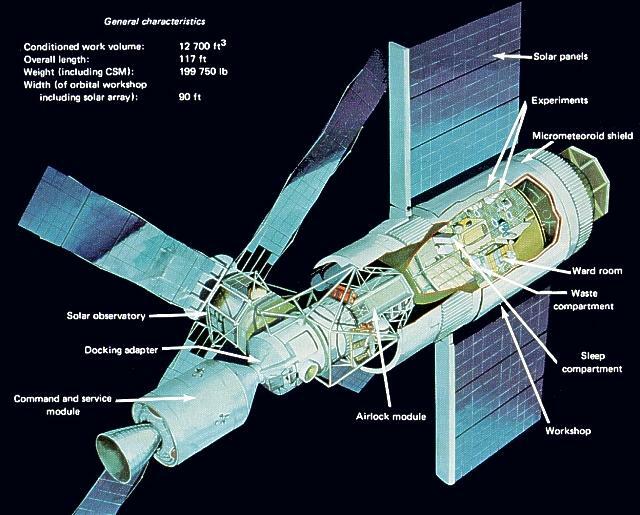 Second Skylab-B program considered - . Nation: USA. Program: Skylab. Flight: Skylab B. Second Skylab-B program between considered to fill late 1970's gap between the Apollo-Soyuz Test Project and the Space Shuttle. Consideration was being given to the feasibility of a second set of Skylab missions (designated Skylab-B) during the interval between the Apollo-Soyuz Test Project in 1975 and the start of Space Shuttle operations late in 1979. The inherent worth of a Skylab-B was recognized, but officials were reluctant to recommend it, on the premise that it would be unwise to allow it to delay or displace the development of the Space Shuttle and other programs already included in the FY 1974 budget. 1974 January 3 - . Second Skylab mission capability would be retained until NASA planning for the FY 1976. - . Nation: USA. Program: Skylab. Flight: Skylab B. Flexibility to conduct a second Skylab mission would be retained until such time as NASA planning for the FY 1976 budget was complete. To accomplish this, NASA issued the following guidelines. Launch umbilical tower 2 would be retained in its present status for possible Skylab usage until a decision was made to prepare for a Skylab launch or to begin modifications for the Shuttle Program. Action would be continued to place in storage existing hardware (including appropriate backups and spares) required for conduct of a Skylab mission. The Skylab Program would fund the activities required to place the hardware in minimum cost storage and the storage costs through June 1974. Skylab B (cancelled) - . Nation: USA. Program: Skylab. Flight: Skylab B. Spacecraft: Skylab. NASA considered use of surplus Apollo/Saturn assets for a second Skylab station in May 1973. Instead the decision was taken to mothball surplus hardware in August 1973. In December 1976, the boosters and spacecraft were handed over to museums. The opportunity to launch an International Space Station, at a tenth of the cost and twenty years earlier, was lost.